Cotton isn’t a vegetable. It’s what your shirt, pants, and underwear are made of. But cottonseed oil, harvested from the seeds of the cotton plant, is technically called a vegetable oil. And according to the American Heart Association, this vegetable oil — high in polyunsaturated fat, low in saturated fat — is a “healthy cooking oil” that’s good for your heart[*]. The AHA is an influential organization, and many folks follow their recommendations. But the real question is: should you? Should you buy, cook with, and eat cottonseed oil? Here’s the truth. The real science behind cottonseed oil — and many seed oils like it — is so alarming that you might never touch the stuff again. Until the late 1800s, nobody cared much for cotton seeds. Cotton fiber was in demand, and the useless seeds were thrown away[*]. But near the turn of the century, Proctor and Gamble sensed a business opportunity and started incorporating cheap cottonseed oil into their products. This effort culminated with the 1911 launch of Crisco — a vegetable shortening now synonymous with the term trans fat[*]. Over the next 30 years, cottonseed oil got big. It replaced lard in many recipes and became the king of vegetable oils. By World War II, however, cottonseed oil was on the way out and soybean oil was on its way in. Why? Simple economics. Soybean oil was cheaper[*]. So by the 1950s, vegetable oils were somewhat popular — but thanks to a doctor named Ancel Keys, they were about to get much more popular. That’s because, in 1955, Keys unveiled his thesis that saturated fat causes heart disease. It wasn’t based on good science, but it still gained traction[*]. And so, in the name of a healthy heart, the AHA began recommending that people replace saturated fats with polyunsaturated fats. Soon, vegetable oils were known as being “heart healthy,” while saturated fats like lard, coconut oil, palm oil, and eggs became synonymous with heart disease[*]. Unfortunately, the AHA had (and still has) this one backward[*]. Vegetable oils are just about the worst “foods” on the planet. That’s because these seed-derived oils are high in certain fats, and low in others. Fat is not just one molecule, but many. And the structure of a fatty acid depends on the number of unfilled hydrogen bonds on the molecule. Saturated fatty acids (SFA), for instance, are saturated with hydrogen bonds. Easy enough to remember. A brief word on saturated fat and heart disease. Ancel Keys — the father of the low-fat theory — based his hypothesis on population data. These were mere correlations between country-wide dietary data and rates of heart disease[*]. But more recent, comprehensive reviews of the literature have found no measurable connection between eating saturated fat and heart disease[*][*]. The truth is, to avoid saturated fat is to avoid some of the most nutrient-dense foods out there. Eggs for choline, meat for iron and zinc, red palm oil for vitamin A. These are all food-based nutrients you don’t want to miss out on. Moving on from SFA, the much-celebrated monounsaturated fatty acids (MUFAs) have one open hydrogen bond and are widely considered healthy. MUFAs like olive oil, avocados, and palm oil appear to support healthy blood glucose levels, blood pressure, and cardiovascular health[*]. When it comes cottonseed oil, there’s some SFAs and MUFAs — yes — but it’s mostly polyunsaturated fatty acid (PUFA). Time to learn more about this original, high-PUFA vegetable oil. Cottonseed oil has a long history, and the story continues to unfold today. The oil is ubiquitous, not only for cooking, but as an ingredient in shortenings, salad dressings, and packaged snacks. Where do cotton seeds come from? Often from India, where cotton crops account for 38% of the country’s exports[*]. Cottonseed oil is pressed from the cotton seed, after which it undergoes an extensive refining process. This process removes, among other compounds, gossypol — a potent toxin shown to suppress spermatogenesis (sperm production) in mice and men[*]. The refining process, unfortunately, also removes vitamin E — a potent antioxidant and free radical scavenger — from the oil. As you can see, cottonseed oil is mostly PUFAs, which is highly unstable. That means the fat oxidizes when exposed to light and heat. Decades ago, to make the product more heat stable, manufacturers used to hydrogenate the PUFA in cottonseed oil. Hydrogenation is a chemical process where manufacturers add hydrogen to make them more solid at room temperature. The only problem is that hydrogenated or partially hydrogenated oils contain trans fats. Not only are trans fats terrible for you — and linked to nearly every chronic disease — they’re the only type of fatty acid in food that you’ll never find in nature. Trans fats are so bad for you that the World Health Organization requested that governments remove them from the international food supply[*]. The United States has been a slow adopter, but even so — most health-conscious people have gotten the memo. Because of this, cottonseed oil typically isn’t hydrogenated anymore. But non-hydrogenated cottonseed oil still has problems. These problems stem primarily from high amounts of linoleic acid, an omega-6 PUFA that accounts for most of the fat in cottonseed oil. Let’s start with the effects of these unhealthy fats on your heart. Many so-called “health experts” have sanctioned cottonseed oil as a quality cooking oil. Here’s their argument: thanks to its moderate SFA content, cottonseed oil is more stable than, say, soybean or sunflower oil. But more stable doesn’t mean it’s stable. No, when an oil contains 55% linoleic acid — you can be sure that oil will oxidize when exposed to high temperatures. And oxidized oils are terrible for you. Oxidation means that the fats are infiltrated by oxygen, thereby changing the chemical composition — and health effects — of the oil[*]. That was an oversimplification, but you get the general idea. Oxidized lipids mean a higher heart of disease. The more of these you consume, the higher your risk. Strangely, however, the AHA continues to recommend vegetable oils for cooking[*]. This is like recommending sleep masks for driving. It’s bad advice. Yet the problems with cottonseed oil don’t end with oxidation. Omega-3 and omega-6 fatty acids are PUFAs. Some of these PUFAs — like the omega-3s EPA and DHA — are called essential fatty acids because you need them and your body can’t synthesize them on its own. They must come through diet. Omega-3s — found mostly in seafood and certain seaweeds — reduce inflammation and support cognitive health[*]. They are, in large part, why fish is so good for you. Omega-6s like linoleic acid also serve important functions, but these days Americans are eating way more omega-6s than humans were meant to eat. Humans evolved to eat, researchers believe, about a 1:1 ratio of omega 6 to omega 3. The standard American ratio? Closer to 20:1[*]. This ratio is a recipe for inflammation. All those omega-6s increase oxidative stress, which in turn, gets your immune system revved up. But unless you’re sick, you don’t want inflammatory immune particles around. This low-grade immune response — the dreaded “systemic inflammation” — underlies most chronic disease processes: heart disease, neurodegenerative, diabetes, and even cancer[*]. Two groups of mice were fed two diets: a standard American (high linoleic) and pre-1970s American (low linoleic). The mice fed a high linoleic diet — just like most American diets — became obese[*]. Here’s why. Once digested, linoleic acid gets converted to arachidonic acid — another O6 fat. Arachidonic acid is a troublemaker. It activates your endocannabinoid system, flipping on the “get fat” switch. It tells your body, start gaining weight now. That’s why, along with sugar, linoleic acid has driven the American obesity epidemic[*]. And when you make a country obese, you also raise that population’s risk for heart disease[*]. How does cholesterol factor in? Here’s the confusing part: high linoleic vegetable oils — cottonseed oil included — seem to lower cholesterol levels. Isn’t that good for your heart? Several studies have shown that vegetable oils moderately lower total cholesterol (TC) and LDL cholesterol (LDL-C) levels[*][*]. Many have hung their hat on this research as proof that cottonseed oil is good for your heart. But total cholesterol and LDL-C are unreliable predictors of heart disease risk. LDL particle number — the number of low-density lipoprotein (LDL) particles in your bloodstream — is the more reliable metric[*]. When there’s discordance, LDL-P predicts risk. If you only measure LDL-C, you may get misleading data. All the positive cholesterol data on PUFAs? It’s on LDL-C, not LDL-P. In other words: it’s not up-to-date with current cardiovascular risk markers. That’s not all. Earlier you learned how oxidized lipids can damage your heart. Oxidized LDL isn’t on your standard lipid panel, and it’s fairly easy to ignore. But your body can’t ignore oxidized lipids from fried cottonseed oil. They’re simply too damaging. Think of Lp(a) as the super-atherogenic LDL particle. If you don’t want LDL particles in your arteries, you really don’t want Lp(a) particles there[*]. And eating partially hydrogenated fats (which cottonseed oil often is) — has been shown to raise levels of Lp(a)[*]. Not good. 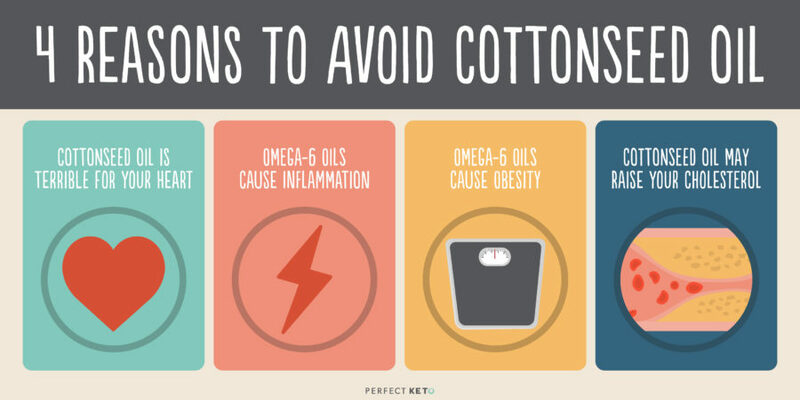 Now you know to avoid cottonseed oil at all costs. But what fats should you eat? Meet the right fats. They’re high in heat-stable MUFAs and SFAs, and low in easily-oxidized PUFAs like linoleic acid. The right fats are perfect for the ketogenic diet — a high-fat, low-carb style of eating that helps you stay lean, focused, and full of stable energy. Some more keto-approved fats include eggs, animal fat, ghee, cottage cheese, whipping cream — the list goes on. Who said keto is restrictive? Some circles still think of cottonseed oil as a healthy cooking oil. Some say it lowers cholesterol and improves heart health. But while the cholesterol claim is narrowly true, the heart health claim is clearly false. Cooking with cottonseed oil generates oxidized lipids, and these oxidized lipids end up in your arteries. Cottonseed oil is also antithetical to weight loss goals. Too much linoleic acid? Hello, weight gain. This has been shown in mice — and on a massive scale, in the American population[*]. But don’t get down on eating fat. Even if cottonseed oil is bad for you, many keto-approved fats are extremely healthy. So toss some butter in a pan, add some MCT oil to your smoothie, scoop some nut butter into your mouth. Your body — and your taste buds — will be glad you did.